The Texas field cricket, Gryllus texensis, is a southwestern species that occurs in Florida only west of the Apalachicola River. It is so similar to the southeastern field cricket that currently the two must chiefly be separated by their songs and that with difficulty. It has only recently been formally named, but where it occurs without its southeastern relative, it has been intensively studied under the name of "Gryllus integer," a name that properly belongs to a species that occurs in southern California east to western Texas. The Texas field cricket occurs from western Texas east to western Florida. Figure 1. U.S. Distribution of the Texas field cricket, Gryllus texensis Cade & Otte. The Texas field cricket cannot be distinguished from the southeastern field cricket except by analysis of the pulse rate of the male's calling song (= wingstroke rate during the trill). At 77°F the Texas field cricket has a pulse rate that is greater than 62. If the two species are singing at the same time and place, a trained ear can identify the crickets that are trilling at the faster pulse rate as Texas field crickets. Figure 2. Long-winged, adult male southeastern field cricket,Gryllus texensis Cade & Otte. Photograph by Paul M. Choate, University of Florida. Figure 3. Short-winged, adult female southeastern field cricket,Gryllus texensis Cade & Otte. Photograph by Paul M. Choate, University of Florida. 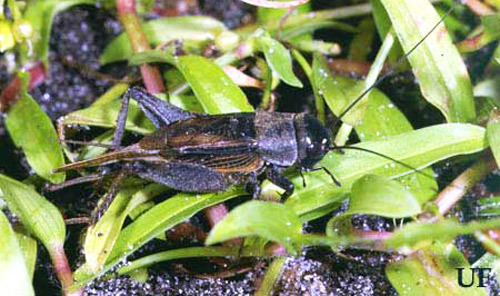 The Texas field cricket has two generations a year with late-summer and fall adults producing overwintering juveniles that become adults in spring of the following year. In western Florida, the fall generation has been intensively studied, but a spring generation has yet to be detected. 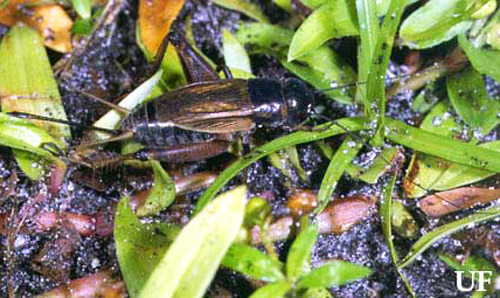 The Texas field cricket occurs in lawns, pastures, and roadsides and is often attracted to light in numbers. The Texas field and the southeastern field crickets are the only Florida field crickets that trill—that is, they produce long-continued sequences of sound pulses that correspond to wing closures. The calling song (692 Kb wav file) of the Texas field cricket has pulses at a higher rate than the southeastern one, and the trills may be interrupted more often and more regularly (graphs). Cade WH. 1981. Alternative male strategies: Genetic differences in crickets (Gryllus integer). Science 212: 563-564. Cade WH, Otte D. 2000. Gryllus texensis n. sp. : a widely studied cricket (Orthoptera: Gryllidae) from the southern United States. Transactions of the American Entomological Society 126: 117-123. Dixon KA, Cade WH. 1986. Some factors influencing male-male aggression in the field cricket Gryllus integer (time of day, age, weight and sexual maturity). Animal Behavior 34: 340-346. Prosser MR, Murray AM, Cade WH. 1997. The influence of female age on phonotaxis during single and multiple song presentations in the field cricket, Gryllus integer (Orthoptera: Gryllidae). Journal of Insect Behavior 10: 437-449. Smith CJ, Cade WH. 1987. Relative fertility in hybridization experiments using three song types of the field crickets Gryllus integer and Gryllus rubens. Canadian Journal of Zoology 65: 2390-2394. Wagner WE Jr, Murray AM, Cade WH. 1995. Phenotypic variation in the mating preferences of female field crickets, Gryllus integer. Animal Behavior 49: 1269-1281.